We aren’t talking about a cute bulldog, or a fart-smelling cat, we are talking about a huge beast. A 550-pound bull on his way to be slaughtered at the Saba Live Poultry meat processing facility in Philadelphia escaped off the back of a truck yesterday afternoon and briefly tasted the thrill of freedom one last time before he was eventually euthanized by Pennsylvania Game Commission officers. The bull had one hell of a day, briefly visiting nearby Kensington High School, looking at his reflection in the glass and then beelining it for Thompson Street. 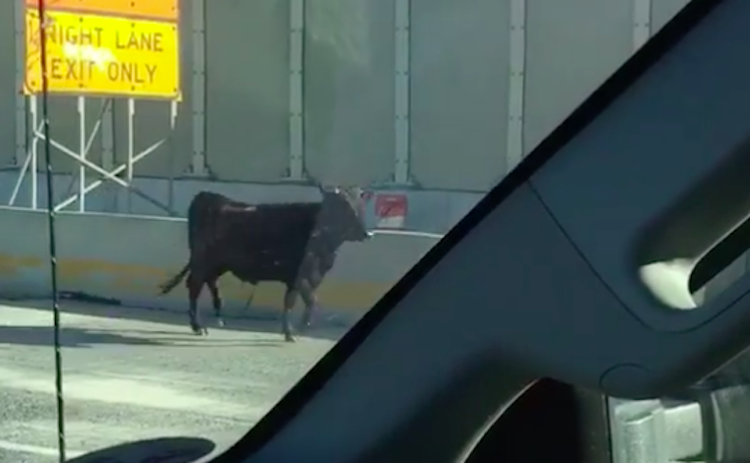 A short while later, the bull found himself living life in the fast lane as it ran down Interstate 95, where stunned commuters captured pictures and video of the big guy doing his thing. The bull made it all the way to the I-676 and I-95 interchange, where he was finally cornered by the Pennsylvania Game Commission and put down for “public safety reasons.” Or in other words, it was pretty much the exact opposite ending as to what happened to “That’s a big bull” Cyrus from those Matthew McConaughey Lincoln commercials. Rest in peace, big guy, and thanks for the ride.